Aptitude is the "capacity of learning" and an aptitude test is a "standardized test designed to predict an individuals ability to learn certain skills" according to the Merriam-Webster Online Dictionary. An aptitude test for career placement is a test that assesses how you carry out a task or respond to different conditions. It is a learning tool to guide you in your decision-making concerning your future career choices. The United States Employment Service began designing the G.A.T.B. (General Aptitude Test Battery) in 1942 and finished it in 1945. This aptitude test was used for career assistance and work screening up to the 1990s. The APTICOM aptitude test was created by the U.S. Department of Labor in the 1980s to replace the G.A.T.B. test. CareerScope was designed in 1995, which is a Macintosh and PC based version of APTICOM. The O*NET Ability Profiler was developed by the U.S. Department of Labor and uses the latest O*NET occupational classification system. Employers utilize numerous other aptitude tests and individuals can find many online self-administered tests. Individuals use aptitude tests to choose careers in which they are most likely to succeed. These tests help identify strengths, weaknesses and natural abilities. You can use this information in deciding on a new or different career path. Students in school find it helpful as well as people wanting to change professions. 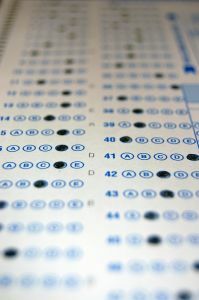 Several employers utilize a career aptitude test as part of their hiring practices. It gives them beneficial information on your abilities to compare against other applicants. A career aptitude test evaluates your abilities in certain areas. This includes: verbal reasoning, your capacity to reason logically; numerical reasoning, your mathematical ability; perceptual ability, your capacity to see resemblance among patterns or shapes; technical ability, your understanding of the fundamental principals of machines; spatial ability, whether you can envision in 3D; language usage, your language and communication proficiency; acuity, your capacity to complete things correctly and promptly. Additional abilities can be measured in some tests. You will not be able to measure your abilities correctly unless you are totally honest in all of your responses. Usually, it works best to select the answer that comes to mind first. If you want a detailed report on a precise career, take vocational aptitude tests created specifically for that career. You can also use this type of a test when you have to decide among a small number of careers to find the best one. To become familiar with taking aptitude test, you can make use of the free tests offered online. Aptitude tests do not evaluate your interests. You may be able to quickly understand a task, but it does not mean you will enjoy doing it. For this reason, it is a good idea to also complete a career interest or career personality test along with the aptitude test. Combining the information found in all of the results will help you determine a career you will be good at and one you are interested in as well.